Last Friday I featured the book Reaching for Sun, a lovely book in verse about a girl with cerebral palsy. Today I feature an interview with the author, Tracie Vaughn Zimmer. She’s on blog tour this week, having visited with Jo Knowles on Monday. She’s stopping by to take part in the world-known MotherReader WhenWhereWhoWhyWhatHow Interview. I’ve kept a journal since the 5th grade. When I visit schools I read aloud from my earliest journal to prove that even young abysmal writers can end up being authors. In the bathtub or behind the wheel. I think it busies my monkey mind and hushes my evil internal editor (at least temporarily). My kids inspire me to be playful with words and to get in touch with that girl smeared with creek mud that I used to be. I needed to honor the pluck, grace and vulnerabilities of my students who had disabilities. I believe they deserve their own stories too. How does Reaching for Sun reflect your own life experiences? I was very close to my granny’s and I spent most of my childhood out of doors. I often felt on the outside of things looking in, but I’m beginning to think we all feel that way. I just sold a new novel to Bloomsbury (in prose!) and now I’m ready to jump into some poetry head first. I’ve got lots of ideas swirling right now for a new collection and it will be fun to decide which ones to pursue. 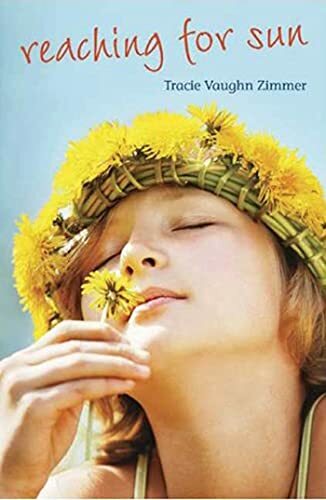 If you want to learn more about Tracie and her wonderful book, check out an interview from her biggest fan and supporter, Little Willow, who told me and others that we had to read this book. Tracie also has her own blog and a website that offers teacher guides and mini-lessons on more than two hundred books. Tomorrow she’ll chat with Cynthia Lord, author of the Newbery Honor book Rules. This looks like it would be a great summer reading book. Yay, MotherReader. I love your 5 Ws. Thanks for the book rec and interview, MotherReader. Thanks. This book looks great! Then give it to friends, kids, everyone.